l conservation practice, too. Young children, the elderly and others often need 80F or warmer water, however, and hydrotherapy calls for warmer water, too. Although 78F to 82F takes in about everyone, how warm you should keep your pool actually depends on personal preference. That depends entirely on you, of course. The temperature recommended for recreational and competitive sports swimming by the American Red Cross and many swimming coaches is 78F. We hear a lot of praise for the pool cover. Is it merited? Most certainly. A good insulating pool cover can reduce heat loss by 50% or more, depending on your location and climate. A pool that is uncovered can lose up to 5F overnight; a good cover can cut that loss by half. Used at night or whenever your pool is not in use, the pool cover can help save fuel costs by cutting heat loss regardless of the type of heating you utilize. And it can even make an unheated pool more swimmable by helping to retain the sun’s energy that naturally heats the pool during the daytime. A pool cover stops water evaporation when it is in place. It isn’t the water loss that’s the big consideration here—it’s the heat loss. Every gallon of water that evaporates from a pool takes with it 6000 BTU’s of heat in the process—and a typical uncovered pool loses 1 to 1½ inches of water a week through evaporation. For a 20 by 40 foot pool, an inch of water amounts to 500 gallons—roughly, a heat loss of more than 30 therms every seven days. (A therm is equal to 100,000 BTU’s). Besides stopping heat loss, a cover saves on pool chemicals, too, by keeping them from evaporating with the water. Tips to help you conserve energy and heat your pool economically. 1 Keep a thermometer in your pool. It will pinpoint accurately the temperature most comfortable for you. 2. Keep your thermostat at the lowest comfortable setting. Each degree more heat than needed could add more to your monthly fuel cost and use up more energy than necessary. 3 Mark the “comfort setting” on the thermostat dial. This will prevent accidental or careless over-heating and waste of energy. 4 Lower thermostat to 70 degrees when pool is to be unused for three or four days. For longer periods, shut the heater off. You will save money on fuel consumption and help conserve energy. 5 Protect your pool from wind. Wind above 3 to 5 miles per hour can lower the pool temperature substantially. A hedge, cabana or decorative fence can be an effective windbreak. 6. Use a pool cover when pool is not in use. This can reduce heat loss by as much as 50%. If you are vacationing for a couple of weeks or shutting down for winter, turn the heater off completely, including any pilot light. 7 Drain heater completely prior to freezing weather. Freezing water inside the heat exchanger can result in costly repairs. CHLORINE, ITS PURPOSE AND APPLICATION: Disinfection is the most important single factor in maintaining a pool which is safe and healthful. Chlorine is the most widely applied disinfecting agent for swimming pool water. The most common form of chlorine for home swimming pool consumption is calcium hypochlorite containing 70% available chlorine. This solid, white material is available as either a free flowing powder, or tablets. Both types have excellent stability under all normal storage conditions. In use, this material dissolves quickly, releasing free available chlorine which is needed to kill bacteria. Pool water should always contain 0.3 to 0.6 parts per million(ppm) chlorine. This chlorine residual may be achieved by adding one ounce of granular calcium hypochlorite for each 5,000 gallons of pool water. In order to be sure that the pool water contains the proper amount of chlorine it is necessary to test periodically using an ortho tolidine test set which is available at your dealer. There are a number of factors which affect the rate at which chlorine is consumed in the swimming pool. Chlorine dissipates more rapidly in warm water than in cold water. Ultra violet light (sunlight) causes an increase in the rate of consumption as does the presence of organic matter such as perspiration and bacteria that are carried in on bather’s skin also increase the amount of chlorine needed to maintain an adequate chlorine residual. For these reasons, it will be necessary to add more chlorine on sunny hot days and when there are more people in the pool than when the opposite is true. Calcium hypochlorite should be added to the water by means of a chemical feeder or a dispensing basket. If tablets are used, it is important to remember that they may bleach a spot on the floor of the pool if they are permitted to rest there and caution should be taken to make sure that they are beyond the reach of children who may place them in their mouths. NEVER MIX CHLORINE WITH ANY OTHER CHEMICALS and be careful to use a clean dry measuring device when handling this material since any contamination may result in a chemical reaction which may cause fire. Chlorine should be added to the pool approximately 15 minutes prior to swimming. Tests for the presence of a chlorine residual should be made frequently and additions of chlorine made as needed so long as there are swimmers in the pool. Algae are very tiny plants that grow in untreated water. The air contains millions of algae spores which either settle into the water or are carried in during rain storms. Once present in water they may be recognized initially, by the formation of slime on the sides and floor of the pool developing into a general cloudiness in the body of the water accompanied by a sudden increase in the pH. In the advanced stages of growth, they take on a green color and, if allowed to progress further, will take on a brownish color and emit obnoxious fish type odors. Intense sunlight is very conducive to algae growth by causing increased water temperatures and more rapid loss of residual chlorine. It can be said, as a general statement, that algae growths will not develop where the proper chlorine residual is maintained at all times. However, it is most difficult to maintain the proper chlorine residual at all times since intense sunlight and increased water temperatures increase the consumption of chlorine therefore making it more expensive to control the growth of algae. Should algae be allowed to gain a foothold in the pool, “shock” treatment is often necessary to remove the growth. This consists of applying from five to ten times the usual amount of chlorine, when the pool is not in use. Allow the chlorine residual to settle back to normal before resumption of swimming. While chlorine may be considered an effective algaecide, it should be apparent from previous discussion on this subject that in order to be effective, it must be present. Since the conditions under which algae grow most rapidly are precisely the same as those under which it is most difficult to maintain an adequate chlorine residual, it has become common practice to employ algaecides to control the growth of algae leaving the chlorine free to act on bacteria. Another factor in favor of algaecides is that most algae require much higher concentrations of available chlorine than do bacteria for the same degree to kill. There are many types of algaecides in common use the most popular of which are the quaternary ammonium compounds and copper based products. Most quaternary ammonium compounds are in liquid form and, since they tend to decompose rapidly, frequent additions are required in order to maintain the proper active residual. On the other hand, copper based products are predominantly granular inform and require only a single application in a given volume of water with occasional additions to compensate for dilution due to addition of new water. Just as an inch is a measure of distance, so pH is a measure of acidity or alkalinity. We know that lemon juice is acid and that lye is alkaline, but to help us express numerically just how acid or how alkaline, we use the pH scale. The pH scale runs from 0 to 14. A pH reading between 0 and 7 is on the acid side. A pH of 7 is neutral, and pH readings between 7 and 14 are alkaline. The pH of swimming pool water should be controlled within the range of 7.2 to 7.8. Water that is decidedly acidic or alkaline is uncomfortable to the bathers. Irritation to eyes and mucous membranes, vague skin discomfort, and bleaching of hair and swim suits is usually caused by improper pH. Human beings feel comfortable in a relatively narrow pH zone (7.2 to 7.8) and it is fortunate that the effectiveness of chlorine is greatest in this same range. Pool water which is acidic (pH below 7) is corrosive to filters, pipes and other metal fixtures and will result in excessive chlorine consumption. Overly alkaline water (pH above7) tends to form unsightly whitish deposits called “scale” which adhere to pool fixtures. In this alkaline range, the effectiveness of chlorine is greatly reduced. Adjusting the pH of water is a simple matter. To raise a pH which is below 7.2, soda ash or pH positive powder or briquettes must be added. To reduce a pH which is above 7.8, muriatic acid or pH negative powder must be added. Swimming pool water is considered hard when it contains dissolved solids in amounts which are objectionable to bathers, equipment, or appearance. Calcium, magnesium, iron and manganese are the chemicals which are the chemicals which are of primary concern. These minerals enter the pool in the water supply, and may also be picked up from piping and pool accessories used in the pool system. The presence of calcium and magnesium contribute to white cloudy water while iron and manganese usually cause colored water. Most hard water conditions can be alleviated through the addition of water softening agents. Cloudy water conditions caused by calcium and magnesium are usually the result of too high a pH and may be easily corrected by adjusting the pH to between 7.2 and 7.8. Well water or ground waters usually contain high percentages of iron and manganese. Pool waters which contain these minerals may not initially appear to have any color, but upon addition of chlorine, they may be oxidized and will appear as a yellow to brownish color. Colored waters may be eliminated by the addition of water softening agents or by the proper use of alum. The swimming pool vacuum operates in a similar manner to the common household unit except it draws water through the vacuum head instead of air. There are two ways in which this may be accomplished. One method employs a jet of water supplied by a garden hose to power the suction which draws the dirt into the head to be trapped in a cloth bag. The other method uses the suction power supplied by the filter which draws the sediment and dirt from the pool floor for removal through the filter. When there is a considerable amount of sediment to be removed the filter valves should be adjusted so that the vacuumed water will bypass the filter and run to waste. It is recommended that the pool be vacuumed about once weekly, the exact schedule to be determined from the pool owners experience. Hair, lint, leaves and insects which enter the pool and remain floating on the surface can be easily removed with surface skimmers. There are two types of surface skimmers-hand and automatic. The hand skimmer is simply a plastic screen or net attached to a long pole and should be used to remove the larger floating objects such as leaves and grass. The automatic surface skimmer is a device which is attached to the filtering system. During the filtering process, part of the surface water is drawn through the skimmer and into the filter, carrying with it dust, small insects, and other fine debris before these can settle to the pool floor. The pool should be skimmed frequently since most dirt enters the water through the surface. Bathers entering the pool frequently carry silt, grass cuttings and the spores or seeds of the fungus infection known as “athletes foot”. The foot bath has been accepted as the most effective means of keeping these foreign materials out of the water. When used properly, it is filled with a solution containing from one to two ounces of granular calcium hyochlorite for each gallon of water. All bathers entering or leaving the pool should be required to place both feet into the solution for a period of not less than fifteen seconds. The test kit is perhaps the most valuable aid to the pool owner and enables him to keep his pool in proper swimming condition. An adequate test kit is one which includes both a chlorine and pH test. Most test kits use the ortho tolidine test for total available chlorine. This test produces a yellow color varying in strength with the amount of chlorine present in the water. When the color produced corresponds to a chlorine reading between 0.3 and 0.6 ppm, the bather is assured that the pool is safe for swimming. Since chlorine dissipates rapidly in hot weather and under heavy bathing loads it is wise to test frequently to assure a sufficient chlorine residual. Just how frequently is best left to the individual pool owners experience. A colorless reading means that all of the chlorine has dissipated and it will be necessary to add more. A reading greater than 0.6 ppm indicates the presence of an excessive amount of chlorine and bathers should not be permitted to enter the water until the chlorine had dissipated to a safe level. Tests for chlorine should be made about thirty minutes after it has been added to allow the material to dissolve and mix throughout the water. The phenol red method is the most common way of testing for pH. In this test, the color changes from amber at low pH to purple at high pH, each color between corresponds to a different pH number. When the color produced corresponds to pH readings between 7.2 and 7.8 the water will be in proper chemical balance. PH tests should be made at least once daily and more frequently during periods of adjustment. When adjusting the pH be sure to allow enough time for the chemicals to dissolve and to mix thoroughly throughout the water before testing. One gallon weighs 8.3 pounds. One cubic foot weighs 62.4 pounds. One cubic foot of water contains 7.5 gallons. 1) Most swimming pool chemicals are stable, retaining their effectiveness and strength for a considerable period of time when stored properly. Be sure to keep containers covered and in a cool, dry place. 2) Calcium hypochlorite, whether granular or tablets, are concentrated chemicals and can be dangerous if not handled properly. DO NOT MIX THEM WITH ANYTHING BUT WATER. Do not let them come into contact with heat, acids, organic or combustible materials such as kerosene, gasoline, oils, and greases, paint products, beverages, tobacco, soap products, cleaning rags and paper, because fire might result. Keep away from steampipes, stoves, heaters and strong sunlight. 3) Use plastic, glass, china, or enamelware scoops, measures and spoons…and be sure they are clean and dry. 4) Measure and add any pool chemicals separately according to directions. Do not mix with one and other before adding to pool. 5) Most pool chemicals are harmful to shrubs, grass and foliage in concentrated from. Keep pool chemicals away from plant life near the pool. 6) Hands should be clean and dry when dispensing pool chemicals. Do not use gloves. Wash hands thoroughly after treating pool. 7) Keep pool chemicals and stock solutions away from eyes. If they should touch the eyes, wash thoroughly with water. 8) Keep pool chemicals in original containers, firmly closed when not in use, and out of the reach of children or pets. 9) Read all labels carefully before using a pool chemical for the first time, and always follow instructions exactly. Information on this page was adapted from “Swimming Pool Care & Maintenance” – Rockwin Products Co. – and is intended as a basic guideline only. Consult the instructions on your specific brand of chemicals for proper use and safety instructions. CHLORINE – Is acting as the main sanitizer to kill algae and bacteria in the pool water. The level should be between 2.0 and 3.0 on your test kit. During hot weather, high readings are better. Ph – Is the level of how acidic the pool water is. You must maintain a good Ph level or your chlorine will not work effectively. The level should be between 7.2 and 7.6. ALKALINITY – Is a Ph “stabilizer”. 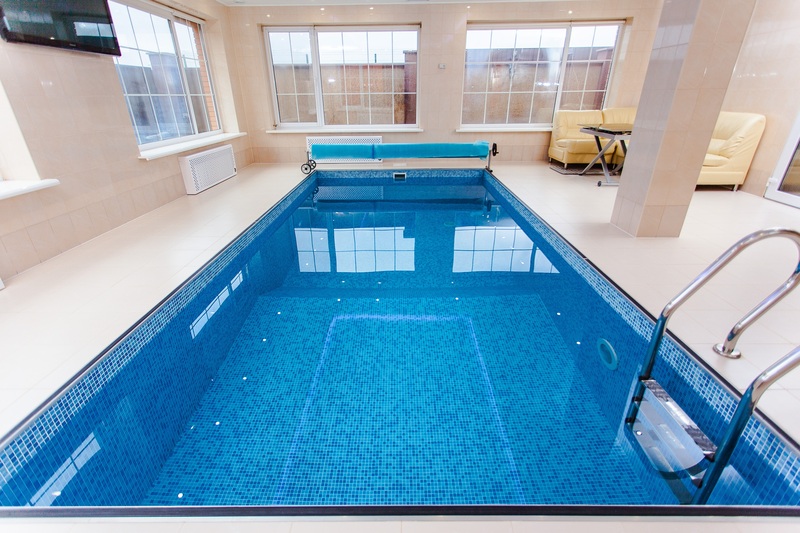 It helps to keep the Ph within the proper levels so that the chlorine can work effectively. It reduces Ph “bounce”. The level should be between 100 – 150. STABILIZER – Forms a protective bond around the chlorine, making it more resistant to being burned off by the sun. Makes chlorine tablets last longer. Pools should be stabilized whenever large amounts of fresh water are added. The level should be 35 ppm and is adjusted by adding Stabilizer Conditioner. REMEMBER – Good water chemistry can only be achieved when all four of these chemical levels are kept constant. Good Alkalinity helps keep the Ph in the right range so that the chlorine can do its job properly. Stabilizer keeps more of the chlorine in the water instead of being wasted ! The result ? A crystal clear pool ! ALGAE: Tiny plants which grow in the water and can discolor it. ALGAECIDES: Chemicals which kill algae and prevent new algae growth. BACTERIA: Microscopic organisms (germs) which can cause illness. CHELATING AGENTS: Chemicals that combine with dissolved metals to prevent water discoloration. CHLORAMINES: The combined form of chlorine after oxidation of impurities. Cause eye irritation and four chlorine-like odors. This form of chlorine is not an effective disinfectant. CHLORINE: The most commonly used disinfecting agent for swimming pools because it is the best chemical material available. CHLORINE DEMAND: The materials in the water which use up chlorine, such as bacteria, algae, dirt, leaves, grass clippings and swimmers wastes. The chlorine demand must be satisfied before a chlorine residual is available to disinfect the pool water. CHLORINE RESIDUAL: The chlorine level in the water after the chlorine demand has been satisfied. The free chlorine residual is the true measure of potential chlorine disinfection. DPD: An indicator solution used to measure the free chlorine residual. DRY ACID: (Sodium bisulfate) A granular material which is used to lower the pH or total alkalinity. FREE CHLORINE: Hypochlorous acid or hypochlorite. This is the active chlorine that kills bacteria and algae and keeps your pool clear and clean. HARDNESS: The amount of calcium or magnesium dissolved in the water. High levels contribute to scale deposits. MURIATIC ACID: A liquid used for lowering pH or total alkalinity. OTO: orthotolidine. And outdated indicator solution that was used to measure the total chlorine residual. PH: A system for measuring the acidity/alkalinity of water. Readings above 7 are alkaline; readings below 7 are acidic. Ppm: Parts per million, the standard measure of concentration in swimming pools. An example is one penny in $10,000. PHENOL RED: The indicator solution which measures pH. STABILIZER: (Cyanuric acid or conditioner) s-triazinetrione, also called Isocyanuric Acid. A chemical which helps prolong the useful life of chlorine in the water by slowing down chlorine decay due to sunlight. SUPERCHLORINATION: (Shock treatment) The practice of adding 5-10 times the normal daily chlorine dose to destroy algae, or to prevent problems after heavy bather loads or severe rains. TOTAL ALKALINITY: This helps the water resist changes in pH. TOTAL CHLORINE: The sum of the amount of free chlorine and combined chlorine. Pump, hose, or sweep away water, dirt, or debris from the cover and deck. Turn on the electric power and start up the support system. Check for leaks and proper operation. If you find any problems, consult your owner’s manual or contact a local pool service company. Have the heater professionally serviced before you use it. Test and adjust the pH and total alkalinity. Super chlorinate and adjust the PH & Alkalinity levels of the water. Run the pump 24 hours a day at the beginning of the season when it may be difficult to get the pool water balanced. You can reduce the pump operating time in one-hour increments once you’ve got the water in shape. The reopening process begins the moment the pool is closed. By keeping an eye on the pool over the winter, the reopening process becomes that much easier. Snow or rain can raise the water level or sink the cover. Since heavy debris can fall in, it is better to remove it immediately than waiting till the spring. Take the supplies (chemicals) out of storage and replace those that have exceeded the expiration date. Remove the cover, and then clean it. Allow it to dry (to prevent mildew) before folding and storing it for the summer. Reinstall or reassemble the pump, filter, and other removed items. Reinstall ladders, diving board, and other deck fittings. If used at closing time, most of the petroleum jelly used to coat exposed metal fittings will have weathered off. Use a dry terry cloth towel to wipe off the remainder if necessary. Remove the plugs and replace return outlet fittings. Bring the water level up to normal. Restore circuit breakers, switches, and time clock trippers to normal operating positions. Restart the circulation equipment and clean the pool. Balance the water chemistry and check the levels frequently during the first few days (until they stabilize). Run the circulation system 24 hours straight for three days or until the water has cleared completely. Depending on how dirty the pool became over the winter, the filter must be backwashed frequently during this period. 1- Remove the leaves and debris from the pool cover with a leaf net and/or skimmer net. Pump off any excess rain water with a submersible pump. If an above ground pool, the excess water may be siphoned off instead. 2- Remove cover. Try to minimize the amount of water and/or debris that gets into the pool water. Some dirty water will always manage to get in – don’t worry about it. You will be adding shock to the water and filtering it soon, so a little dirty water will not hurt anyone ! 3- Lay out pool cover and sweep or brush off any remaining debris. If you do not store your cover indoors, and you keep it outside or in a shed, then you do not have to worry about getting the cover particularly spotlessly clean. If you do keep it in the garage or basement, you may want to clean it to a greater extent. Properly fan-fold cover and store away. 4- Empty the water out of any water tubes you may have. On above ground pools, deflate the air pillow. Clean off items and fold properly and store away. 5- Unplug all piping, both in the pool and at the filter system area. 6- Re-attach any deck equipment you have such as ladders, rails, diving boards, etc. Make sure to reconnect any grounding wires or straps that may have been attached to the metal parts last year. 7- Lubricate all bolts on the dive board, ladders and/or rails. This will prevent them from rusting over the summer. Remember, you are probably the one who will be closing the pool, so you want the bolts to come off easy at closing time ! 8- Re-install the skimmer baskets and any return jet eyeball fittings. If an above ground pool, you may have to re-attach the actual skimmer and return fittings onto the pool (depending on how the pool was closed). If an above ground pool, also hookup any hoses from the skimmer and return jets to the pump and filter. 9- Hook up pump, filter and any other additional equipment you might have (booster pumps, spa equipment, waterfall circulation pumps, heaters, etc.). 10- Turn on the power to the pool system. You may have to turn on the circuit breaker from the house. Start and check system. Check for leaks or drips. Make sure any grounding straps or wires are properly connected to the pump and any other components that need them. Make sure pump primes properly. Check for proper flow. Backwash the filter thoroughly. Add new DE if you have a DE filter. If some pieces of equipment do not appear to be operating properly, you might want to first check our INFO/TIPS page under the POOL TROUBLESHOOTING section. If you cannot repair the problem yourself, contact a local pool professional for assistance. 11- Shock the pool with any chlorine shock product. This is available in liquid or granular form. You want to add enough to raise the chlorine level of the pool to at least 3.0 ppm (darker yellow color in most liquid test kits). If you use granular shock, do not throw it directly into the pool ! You could bleach and stain the liner. It is best to mix the granular shock chlorine in a bucket and then add that mixture into the skimmer while the system is running. 12- If your pool is a “green swamp” when you open it, see the poolandspa.com TIPS/INFO section under HOW TO CLEAR A GREEN POOL for further information. 13- If your pool water is relatively clear, accurately test your water for chlorine, PH and Alkalinity levels. If available, also test for Stabilizer (cyanuric acid). Adjust these chemicals to the proper levels. Add a high quality algaecide to the water. See our TIPS/INFO section under EZ POOL WATER CHEMISTRY section for more information. 1- Obvious drips coming from filter tank, pump or visible pipes. Try tightening the fittings. If you cannot get leaks to stop, contact a local pool professional. 2- Sand in pool under or near the return jets. This may mean the pool has an underground pipe leak or, if you have a sand filter, it could mean that something in the sand filter is cracked. If you are loosing water as well, we suggest contacting a local pool professional. If you are not losing water, then take apart the sand filter and look for a cracked part. 3- DE in pool under or near the return jets. This means that there is something in the DE filter that is ripped or cracked. Take the filter apart and look for cracked part or ripped element. 4- DE filter isn’t putting out enough water pressure and/or isn’t effectively filtering the pool. You should backwash the filter immediately. Add new DE. If problem persists, filter may be in need of an “acid wash”. If you do not know how to do this, we suggest contacting a local pool professional. 5- Sand filter isn’t putting out enough water pressure and/or isn’t effectively filtering the pool. You should backwash the filter immediately. If problem persists, filter may be in need of a sand change. If you do not know how to do this, we suggest contacting a local pool professional. 6- You notice many air bubbles mixing with the water coming out of the return jets. Probably means that there is a suction line leak, usually under or by the skimmers. You could try digging down and see what you can see, but we suggest contacting a local pool professional to repair something like this ! 7- You notice settled or wet dirt. You see bricks or patio blocks around the skimmers or return jets settling or sinking into the ground. Probably means an underground pipe leak at that point. You could try digging down and see what you can see, but we suggest contacting a local pool professional to repair something like this ! 8- Pump makes a loud squealing noise, it heats up or is not running to its full capability. This indicates that the pump is in need of professional service. Either remove it and bring it to a pool store or pump shop for repair – or replace the pump. >>> If the pool water level goes down to the bottom of the skimmer and stops, this usually means that it is a suction line leak, most likely directly under the skimmer. We suggest contacting a local pool professional to repair something like this ! >>> If the pool water level goes down to the bottom of the return jets and then stops, this usually means that it is a return line leak, most likely directly by the wall jet return fitting – but it could be anywhere in the return line. We suggest contacting a local pool professional to repair something like this ! >>> If the pool water level goes down to the top, middle or bottom of the light unit, this usually means that the light is leaking. This is usually the fitting in the light niche where the metal or plastic conduit pipe is attached to the metal niche. We suggest contacting a local pool professional to repair something like this ! >>> If the water level goes down to any other level on the side walls and then stops, this usually means that the leak is in the liner on the pool side wall or possibly in the step unit gasket. Inspect the pool visually around the water level and check to see if you can see a hole. Check the area where the LADDER comes in contact with the liner. This is a very common leak point ! If you cannot clearly see a leak hole, we suggest contacting a local pool professional to locate & repair the leak. 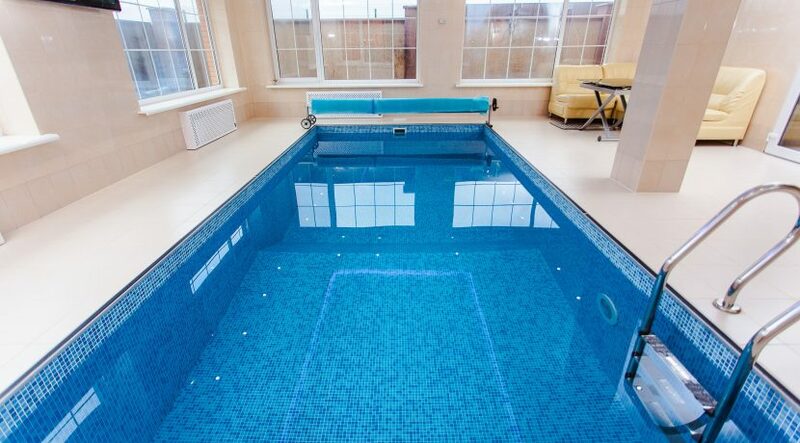 >>> If the water level goes down past they side walls, then it usually means that the leak is in the pool floor. This is bad ! You do not want all the water to drain out of the pool. It is bad for the liner and very bad for the pool walls – you do not want the pool to fall in ! If you see that you are quickly losing all the water in your pool, put a hose in the pool, start to refill it and contact a local pool professional to locate & patch the hole. The proper cleaning of a hot tub begins with proper chemical treatment. Follow your manufacturers instructions, or see a pool or hot tub dealer for advice on treating your hot tubs with the appropriate chemicals. Remember to clean your filter on a regular basis. For example, clean the filter when you are cleaning your hot tub. Manufacturers would recommend filter cleaning more frequently, however it maybe more realistic to do so when cleaning your tub. To properly clean your hot tub you drain it completely so you can use a soft cloth or sponge to thoroughly clean the inside of the hot tub. Use a manufacturer recommended product or mild detergent (Most tubs are acrylic, do not use anything abrasive). Rinse your tub before refilling to prevent soap suds when turning on your tub. The frequency of cleaning depends on the frequency of use, a general rule of thumb is once every three months. Body oils can be bothersome in hot tubs this is lessened by regular cleaning of the tub. You can buy a specialty product called a ”Zorbie” which can be placed directly into your hot tub, it floats and it absorbs body oils keeping your tub that much cleaner.